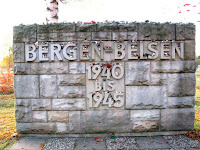 ... 1945 (65 years ago today), "horrified soldiers found piles of dead and rotting corpses and thousands of sick and starving prisoners kept in severely overcrowded and dirty compounds" when British troops liberated Bergen-Belsen concentration camp, located near Hanover, Germany. The camp commandant, Josef Kramer, "who was described as 'unashamed,'" was arrested. By year's end he would be found guilty by a British military court sitting at Lüneburg, Germany, and executed by hanging.